Chosen to care, he makes his way through town helping and hurting (when necessary) until only one question remains: Who’s behind Ed’s mission?” (Summary found on Goodreads). I am the Messenger follows an array of characters that, essentially, have little to nothing. Ed is a cabdriver, not in school, and, for the most part, unhappy with his life. I couldn’t really find any character that was satisfied with their life. Not that that’s bad. On the contrary, I actually enjoyed reading about characters like this. Usually you see the successful guy or the teenagers having problems. It was a breath of fresh air to read about characters out of high school that were still struggling. Too often, this group of people is overlooked in young adult fiction. Not to mention, most of the characters you read about don’t live completely ordinary lives. I think that was the point of this book, to show that ordinary people can make a difference in the world too. One note about this book: Don’t go into it expecting something like The Book Thief. The only similarity they have is the author and the importance of the message. 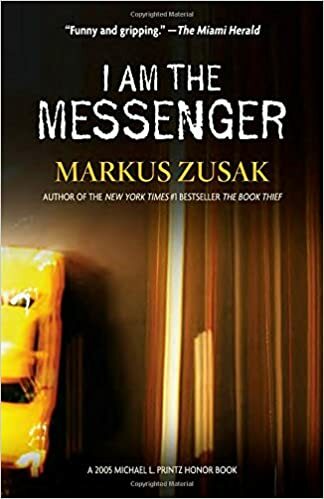 With that said, I am the Messenger is a profound book that everyone should read in their lifetime. I can’t say I loved it, but I can say that this book makes an impact and is extremely important. I had started it a few years ago, but put it down because it wasn’t what I wanted to read at the time. Coming back to it, I was expecting the book to be like the first few chapters I read before: lacking much seriousness. Oh, how wrong I was. This book is heavy. Many of the circumstances in it are horrible. It shows the brutality of the world–how cruel some human beings really can be. Above all, though, kindness remains the solution to all problems. I had some problems that kept it from being five stars. First, Ed annoyed me so much. His thoughts were so repetitive. He pined the entire book over Audrey and complained about every bad thing that came his way, but he didn’t really do anything about it. Not to mention, the whole scene with him and the runner was creepy. If I were that girl, I would have been very fearful of the guy stalking me every day. Is it just me that thought that was insanely weird? Second, It was incredibly unrealistic. The whole book felt contrived to give this message about the world and kindness and love. Look, I loved the message and the plot was crazy good, but I could have handled a little more reality here. Especially when people start showing up in his house and no one is concerned whatsoever. Hello, welcome to Crazyville, where it’s perfectly normal for random creepazoids to hang around places! I am concerned for this world. However, I loved that this took place in Australia. You could totally feel that too. I think it’s nice to see books taking place elsewhere from America or the UK. I don’t see enough Aussie books and I’d really like to change that. So if anyone has any recommendations, leave them in the comments!